As you may have seen from our sister site, the Family Lighty have recently returned from their first little holiday as a family. Something I was particularly worried about was how I was going to sterilise bottles in hotel rooms without the use of my microwave steriliser. After a bit of research, I was pointed in the direction of the Milton Cold Water Steriliser Bucket. After using hotel kettles to fill the bucket (as hotel sinks are often too small to fit a 5 litre bucket under the tap to fill directly!) and adding a Milton sterilising tablet, the water would then be sterile for 24hrs. This enabled me to wash and sterilise bottles easily after our days out, and again the next morning after breakfast and the night feed! We also found that it was a handy place to pack the washing up liquid, bottle brush and spare bottles when not in use in the car boot!! 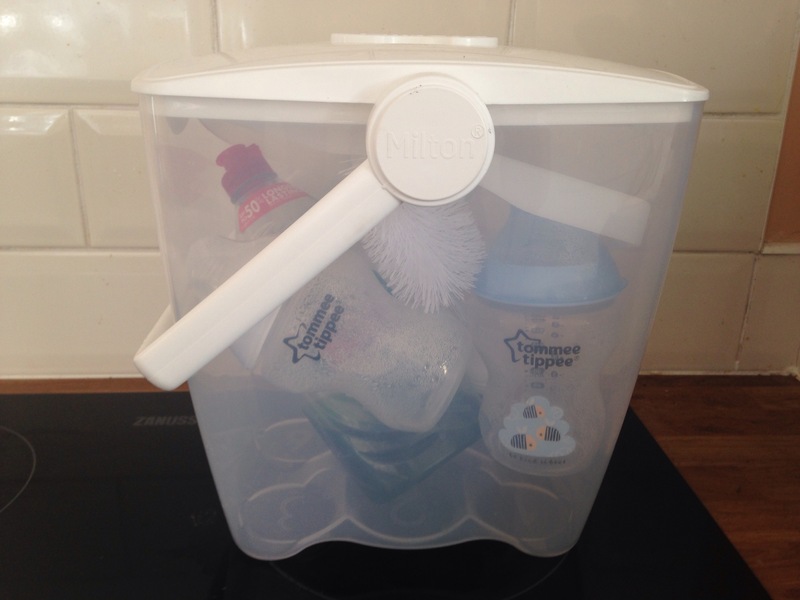 The Milton Sterilising Bucket is s great place to store your spare bottles, washing up liquid and bottle brush when in transit! We decided to eschew the travel cot on this occasion and take Baby Lighty’s Moses basket. He’s never slept in a big cot before, and although he’s generally a very placid baby, we weren’t sure whether a hotel room was the best place to try it for the first time! Of course, we were lucky that we could do this as we only have one child and were taking the car, therefore giving us the space to pack it. If you were flying or had two children in the back seat, this probably wouldn’t be an option! 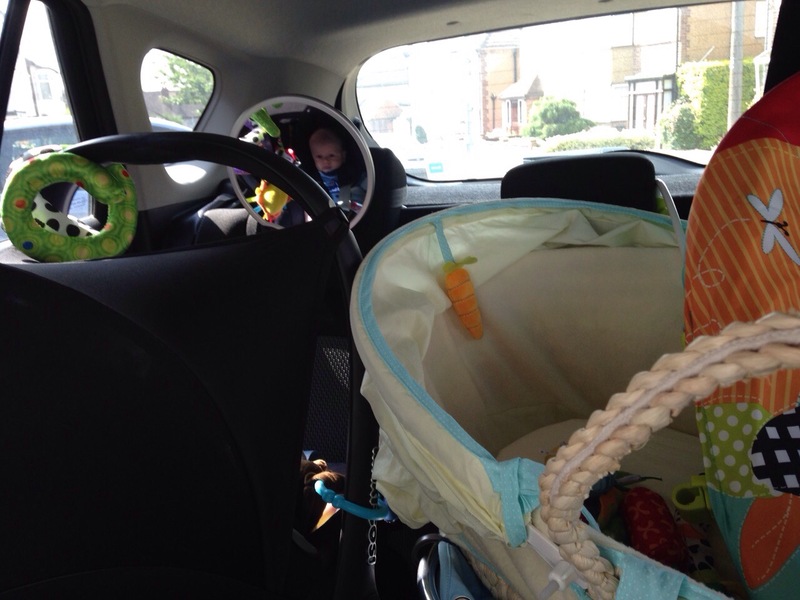 We had the luxury of space to take Baby Lighty’s Moses basket and bouncy chair, even if it did mean clogging up the back seat!! We also took his sleeping bags and at the last minute my husband chucked Ewan the Sheep in the car – what a good move that proved to be, as it meant that Baby Lighty had some familiar sounds around him to help him sleep! Again, purely because we had the luxury of space, we also took Baby Lighty’s bouncy chair. This proved to be a good piece of kit to have at breakfast, as we would take it with us into the hotels’ restaurants and ask to be tucked into a corner where we could sit Baby Lighty in it. He was quite happy to play while we ate our breakfast without having to take it in turns. I imagine as he gets older, we will instead use Baby Lighty’s travel high chair, or we’ll ask the hotel for the use of a high chair. We could, of course, have used his car seat to sit him in, but we didn’t feel like this was very fair as he was then going to be stuck in it for some time as we covered the distance to and from Scotland. Even with feeding and comfort breaks at National Trust properties and roadside services, I’d be fed up if I was strapped into a car seat all day! This is something that we didn’t pack but wish we had’ve done. We wish we’d thrown in some of those large, strong plastic or canvas bags that you pay a small amount for in supermarkets or sports shops. After Mr Lighty’s fourth or fifth trip backwards and forwards from the car, it would’ve been very handy to have had one of these to transport all the smaller bits of kit in in one go!! You may wonder why I’m including this last item, but this is a little tip that I picked up on a forum when packing my hospital bag. 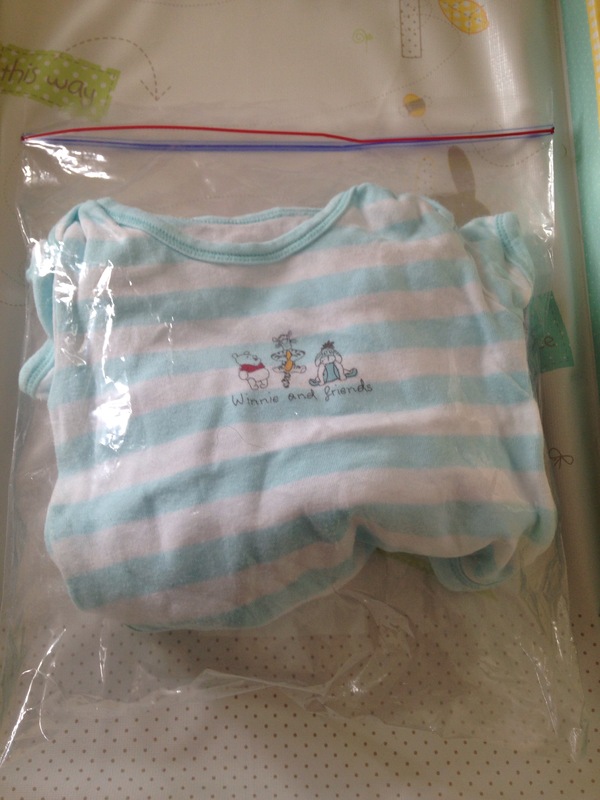 Pack your baby’s outfits in individual ziplock bags – large resealable sandwich bags are usually big enough for small babies – or pack all of your child’s vests, socks, tops, trousers etc in separate bags. This way, if you’re living out of a suitcase for a couple of days – especially if you’re moving from hotel to hotel – you’ll be able to find your baby’s tiny clothes quickly and easily without having to tip the whole suitcase out! Baby Lighty’s vests, packed in a ziplock bag. Have I missed any top tips which will help with packing in future?? Let me know in the comments below! Love the ziplock idea – I’ve never seen that before but a very good idea! I may do this for my change bag actually to make it easier to grab spare clothes when we’ve experienced a poonami!! It was Becky on our Facebook group that gave me the idea for my hospital bag – I also do it for my change bag!! Stopping by via #mummymonday I am so nervous about taking my little one on holiday that I’m considering delaying it till she’s a toddler or maybe 5. Aw! Glad the ziplock tip was useful!